When it comes to the reputation of your business online, it definitely is a global village. With a click of a mouse, potential customers can check out reviews and find both negative and positive comments. According to the Huffington Post, 90% of customers are influenced by online reviews. In this environment, your business lives and dies by its reputation. 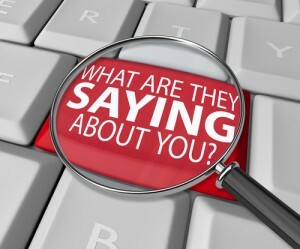 Taking care of how you are perceived on the internet is a must for any business. You may choose to not deal with it, but the situation won’t go away. You are at the mercy of your reputation. Smart businesses are proactive. Consumers rely on the testimonials and reviews of people who have used specific products and services. Whether it is Yelp, Facebook, Twitter, Angie’s List, Google, forums or blogs, customers are not shy about getting the word out about their experiences with online and brick and mortar businesses. Every business has occasional troublesome encounters with customers. This is to be expected. It can be a package that wasn’t delivered on time, a widget that broke, an app that had a glitch or a meal that was served by a surly waiter. The goal of all smart business owners is to resolve problems as soon as they come up, preferably before reviews are written but definitely as soon as you hear about it. This keeps a customer and prevents word of mouth from scaring away others. Here are six tips that have helped successful businesses protect and manage their reputation online. #1. Take control of your brand. Make sure you are the one in control of your brand name, on including domains and social media platforms. Use the same name to be consistent. Use a service like KnowEm.com, which provides a list of social networks and domains to check in order to be sure only you have claimed it. Pick three to five major social media platforms and get active on them. The major players are Facebook, Twitter, Yelp, Angie’s List and Google+. But it might serve your business to look into YouTube, Tumblr, LinkedIn and others. To establish an active presence takes consistent effort and time. More than five outlets will be more than a businessperson can handle alone. Don’t overdo your social media efforts or your will end up not establishing a strong presence anywhere. Set up your brand on each of the platforms you choose. Use the same logo and name for brand recognition. Put up new info and answer questions at least once a week, though two or three times is better. Do it regularly so people know you care. Keep an eye on how you are perceived online. Use online monitoring tools to help you keep up to date on your reputation, like Twitter Search and Google Alerts. A solid, consistent presence online will help people get to know you. If you feel like an old friend, people online will tend to discount negative reviews and give you the benefit of the doubt. This leads to positive word of mouth if a negative comment is posted. #4. Be active on your blog. Write regularly and don’t worry that you don’t sound like Hemingway. Simply let people know what is new at your business, write about things that inform your readers and entertain them. Your blog is your safe harbor online. It gives you a channel to respond to bad reviews or situations. Prominently display on your blog a link to testimonials on your website. These are an excellent antidote to negative reviews. #6. Respond immediately to problems. Reply right away to negative posts and comments on your social media accounts. Jump on them quickly before negativity spreads. Ask what the problem is and listen to the response. Don’t act defensive or aggressive. Listen, apologize, explain if it will help and offer to reimburse them if that is appropriate. Do what it takes to make the situation better. Then fix your payment system, sales info or whatever was the source of the problem. That way it won’t happen again. Never argue with an angry customer online. EVER! Following these six steps consistently will help maintain a positive reputation for your business online. If you are a business owner in any of these genres, financial, photographers, dentists, hotels, restaurants, construction, HVAC, hardware stores, real estate, or any business owner and want more information on Instagram or Social Media Marketing, please contact Blast Creative today!